Norman John Rahn, 95, of Clifford Lake, passed away Friday, January 18, 2019 at Spectrum United Hospital surrounded by his family. He was born the son of John and Lena Rahn on November 25, 1923 in their home in Stanton. 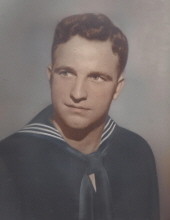 Norman proudly served in the United States Navy during World War II. He married Blanche Ellen Deal on October 11, 1946. While living in Greenville, they started a family with the birth of their two sons, Alan and Robbie. They found their paradise at their cottage on Clifford Lake, which would become their permanent residence. In 1987, after 40 years, Norman retired from Federal Mogul. He enjoyed Friday night fish fries at the American Legion, pontoon rides on the lake, fishing, hunting, Detroit Lions football games, and later in life, his daily car rides with his dog Mary on his lap. He loved visits from his grandchildren, Leslie, Amie, and Rebecca and adored his great-grandchildren, Bryce, Britney, Brianna and Braylin. He was proceeded in death by his wife, Blanche Rahn; parents, John and Lena Rahn; brother, Walter Rahn; and sisters; Evelyn Wood and Blanche Anderson. He is survived by his sons, Alan Norman Rahn and Robbie Norman Rahn, both of Clifford Lake; grandchildren, Leslie (Larry) Brugel of Cedar Springs, Amie Rahn of St. John’s, and Rebecca Rahn (Todd Burnett) of Lansing; four great-grandchildren, Bryce Alan and Britney Blanche Buck and Brianna Rose and Braylin Shay Brugel. Norman was dearly loved by his family and friends and will be greatly missed. Funeral services will be held at 11:00 am Thursday, January 24 at Hurst Funeral Home, Greenville with Ken Armstrong officiating. Military honors will be rendered under the auspices of the Ray Booth American Legion Post 101 Honor Guard. Burial will immediately follow at Rest Haven Memorial Gardens, Belding. Visitation is from 6-8 pm Wednesday, January 23 at Hurst Funeral Home. Memorials contributions may be given to the Ray Booth American Legion Post 101 (1320 W. Washington Street, Greenville, MI 48838). To send flowers or a remembrance gift to the family of Norman Rahn, please visit our Tribute Store. "Email Address" would like to share the life celebration of Norman Rahn. Click on the "link" to go to share a favorite memory or leave a condolence message for the family.